It's no coincidence that great writers, filmmakers and artists such as Picasso, Irving, Hemmingway, Welles and Brennan have all been drawn to this beautiful region of Spain. This is your opportunity to discover why. We begin in Granada with an unforgettable visit to the Alhambra. It's sublime Palaces, tranquil gardens (Generalife) and trickling fountains provide a glimpse into Spain's incredible Moorish Legacy. 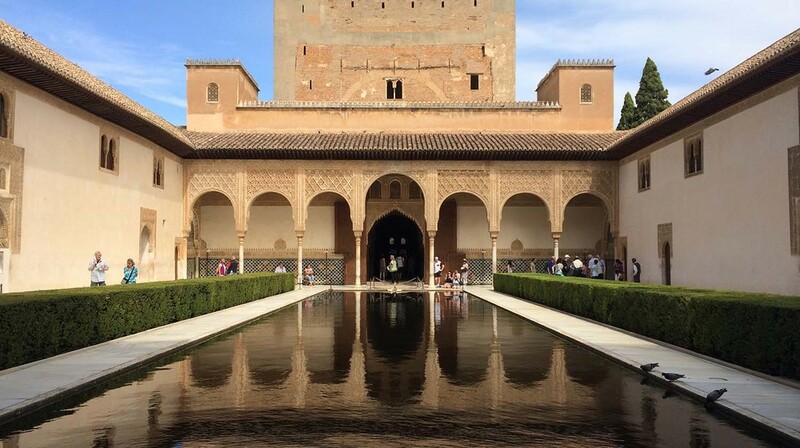 For an overview of the Alhambra Palaces and Generalife, take a look here at their Interactive Alhambra Map. Wander through the Albaycin, till you reach the magnificent view of the Alhambra from St Nicholas at dusk, soaking up the atmosphere, followed by a Flamenco performance in the evening. Enjoy a traditional lunch in Antequera en route to our wonderful accommodation in Ronda where we stay for a week during our Artist's Retreat in Andalucia. Ronda is one of the most spectacular towns in Andalucía. Its secluded position in the Serrania de Ronda mountain range, built on a high plateau is breathtaking and beautiful. A walk around the old town will entice you with its many picturesque vistas, painting and photographic opportunities. The ‘Puente Nuevo’ bridge built in the 18th century is a masterpiece of engineering spanning a deep gorge with vertical rock faces on both sides. The architecture and typography of Ronda make it one of the richest subjects for painting to be found anywhere in Spain. Inspiring stories to say the least, Ronda has a magic that is intoxicating with a new secret to discover around every corner. From Ronda we drive to the surrounding Pueblos Blancos where we will see amazing landscape and beautiful villages to draw inspiration from. It's each person's choice as to whether they work on location or back on the terrace, under shade in privacy at our accommodation. The scenery on the way to the Pileta caves is as dramatic as any in Andalucía. The Pileta caves, with their palaeolithic and neolithic rock paintings are privately owned and were discovered by the present owners Grandfather in 1905. Inside there are caverns of varying sizes - the tallest is 12 metres high- where Stalactites droop overhead. Some of the oldest paintings date from the Paleolithic period some 25,000 years ago showing a pregnant mare, goats and an enormous fish. These caves are incredibly impressive and visitors are taken through in very small groups, which is perfect for us. Arcos de la Frontera is another stunningly beautiful Pueblo Blanco. More compact than Ronda with a mystery all of its own. 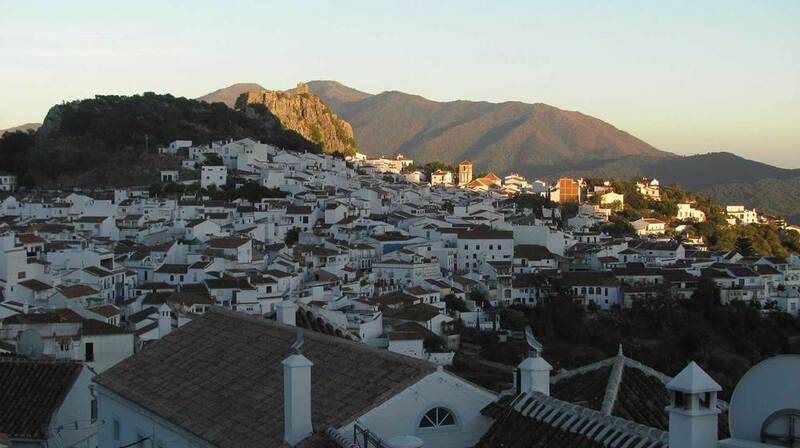 Our accommodation is unique in offering unparalleled views of Arcos and the rich patchwork of the valley below. Set up your easel on the rooftop terrace or find an abundance of subject matter from the fabulous interior of our hotel to the street vistas of Arcos. Watch the sunset from the rooftop enjoying a glass or two of fino, accompanied by the sound of swallows and the bells of San Pedro. From Arcos we also take day trips to Vejer de la Frontera and Cadiz on the Costa del Luz, enjoying a wonderful lunch at Bologna's beach restaurant surrounded by Roman ruins. •Easels for painting on location. •Accommodation in luxury hotels and villas set in stunning locations. •Farewell lunch or evening tapas depending on departure times. •Day excursions to Vejer de la Frontera, Cadiz and Bologna. Sometimes the days itinerary may be inter-changed depending on the weather and availability of tickets. We advise our guests to have a reasonable level of fitness. We will take all care possible to ensure your trip is safe and comfortable, however we do require our guests to have travel insurance. If you have any queries and dietary requests please feel free to contact us. This is a rare opportunity and our places are strictly limited and as a consequence we advise anyone interested in attending the Artists Retreat to book early to avoid disappointment.